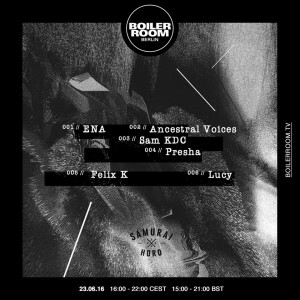 The acclaimed Samurai Horo squad will be taking claim of Boiler Room Berlin studio for a 6 hour session of dystopian experimentalism.The sub-label of Samurai Music Group will be represented by a stellar lineup consisting of Ancestral Voices, Ena, Sam KDC, Felix K, Lucy and label boss Presha. With razor-sharp sonics and a wealth of experience, this is one collective which will take you to the edge. As always, you can watch this event live on the website for free.